This championship gathered 430 athletes from 14 regions of the country and the cities of Almaty and Astana. Kazakhstan Championship uses two-hand system (sportsman’s total place is defined by his both hands results). In the team competition among the girls unconditional win has Jambul region. Girls of this team took 7 of 8 possible golds. Among men, as expected, a confident victory was gained by a team of South Kazakhstan (sports club "Shardara armsport"). The boys have won 10 of 11 possible gold medals. Athletes of the national team of Kazakhstan on every competition pleasantly surprise the spectators and fans. Once again Magzhan Shamiev surprised everyone. 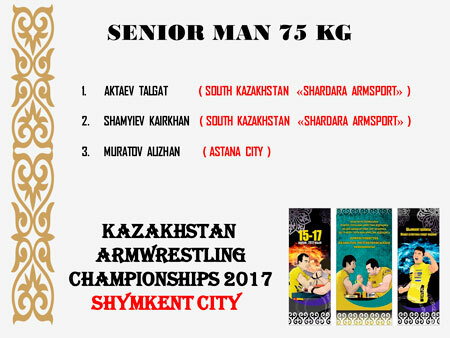 He was the winner in the category of 80 kg. After the category fights, he pulled and won in the open class in a beautiful and protracted fight with Georgiy Dzeranova category of 100 kg. Absolute champion was Medet Kuttymuratov, Professional World Cup-2016 medalist. Medet won a unique prize - the specially made leather belt and silver. The second was Kydyrgali Ongarbaev, bronze medalist became Magzhan Shamiev. 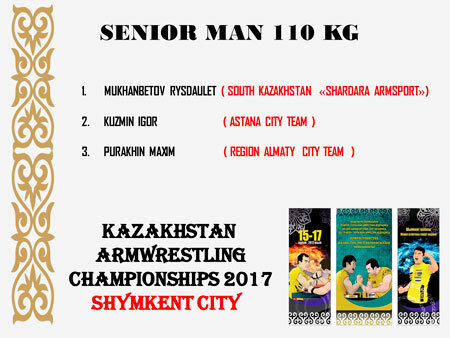 All prize-winning three of absolute category is form South Kazakhstan sports club "Shardara armsport". This championship was qualifying and on its results the national team of Kazakhstan, which will take part in the Asian championship and world championship, will be formed.